Sy Montgomery “is a modern miracle,” says Book Magazine, “bawdy, brave, inventive, prophetic, hell-bent on loving this planet.” Writing as she does about animals and people at a turning point in our history, Montgomery has shown us that we share our planet with the most outlandish creatures. She’s documented great apes, man-eating tigers, and pink river dolphins, but her latest muse, the golden moon bear, is an animal whose name and appearance evoke another world altogether. Only eight bear species are known to science: the American black bear; the grizzly; the polar bear; the South American spectacled bear; Asia’s sun bear, moon bear and sloth bear; and the Chinese panda. Moon bears’ (most similar to the American black bear) lineage as black-coated mountain dwellers has never been challenged-until, on the edge of the new millennium, Montgomery and her scientific colleagues turned up this golden form of unknown origin. 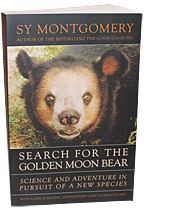 Search for the Golden Moon Bear travels to Southeast Asia, home of these luminous bears, for a look through the broken mirror of the evolutionary record into the present day. Hobnobbing with scientists and locals, Montgomery pieces together a living portrait of her elusive subject. “When the animal is well,” says one Cambodian zookeeper, “he is a nice animal like a friend.” But the bears are not always well. With bear paws coveted and culinary treats, and bear parts administered as medicine for everything from nervousness to heart problems, the bears’ world is a perilous one-just as it is for humans. In pursuit of a new species, these scientists and adventurers encounter danger and mayhem at every turn-riding motorcycles across active minefields; evading armed militia for a glimpse of moon bears; pulling hairs from live bears for DNA tests. Search for the Golden Moon Bear is a field report from the frontiers of science and the ends of the earth, seamlessly weaving together folklore, natural history and contemporary research into a fantastic travelogue.